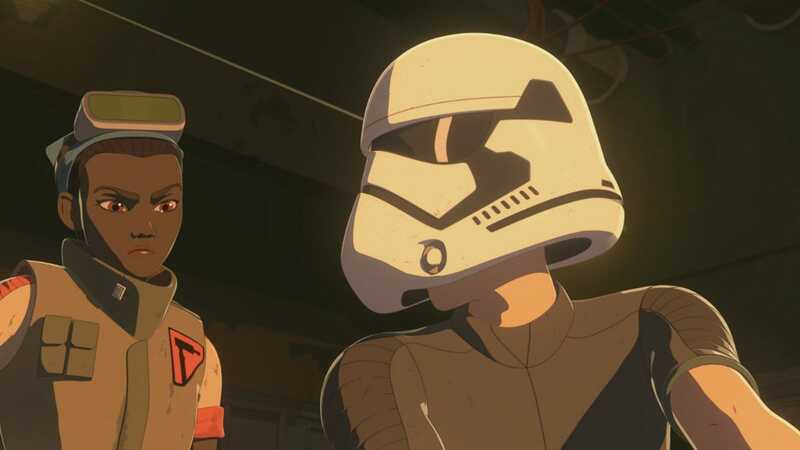 If you watched Star Wars Resistance Last night, you may have been a little letdown. Not because the episode was bad or anything. Actually, it's pretty solid. It just so happens that many of the episodes aired the final scene of the episode. vital piece of information in it. How did that happen? Well, Disney always releases a clip to help promote the upcoming episode of Resistance but, most of the time, that clip is from the beginning of the episode. This time though it was literally the final scene. So I spent the whole time watching the episode, called "The New Trooper," I saw the entire episode, which actually set up the clip. The clip was the payoff. I've been spoiled. Here's the clip. That's the last minute and half of the episode. No need to watch the rest of it if you are just looking for mystery and intrigue. Everything is spelled out right there. We finally have an idea why the First Order is so obsessed with the Colossus. And that's where things get interesting. What was? Though we'll take that clip at face value, it's entirely possible the next few episodes of Resistance will prove Yeager and Kaz to be wrong. Maybe it was not why the First Order wants the Colossus. But, assuming it is, you have to wonder when, or if, this was the first order. It's possible, but unlikely, that they're preparing for it. Let's break this down. Resistance takes place before The Force Awakens and The Last Jedi takes place immediately after The Force Awakens, s o we know what comes next in the animated series. Pretty soon Resistance wants to sync up with The Force Awakens and Kaz wants to see Starkiller Base destroy most of the New Republic with a single shot. The Resistance wants to destroy Starkiller Base, get chased back to D'Qar, evacuate, and then lead the first Order to Crait for another showdown. That's a few battles but not one that would need a full-fledged fleet of ships. Stormtroopers on the Colossus watching General Hux's speech from The Force Awakens. NOTE: This is a future episode, not The New Trooper. We pulled it from the trailer. So this was somehow happen tangentially to the events in the movies? Does the war take place between The Last Jedi and Episode IX ? Or-and this is a stretch, I trust part of Episode IX ? It's highly unlikely but not totally out of the realm of possibility, right? Here's the most likely scenario though. The First Order is simply over-preparing. They just do not know how to do it anymore. Plus, again, this is all pre- The Force Awakens. Plus, again, this is all pre- The Force Awakens. Supreme Leader Snoke does not know about Rey yet. He does not know the whereabouts of Luke Skywalker. Plus, once he's killed and Kylo Ren takes over, it's likely to change his direction. So while, yes, this talk may have become significant, it's much more likely that it will get ironed out. Wait. We were talking about Resistance right? Anyway, yes, Resistance . It would be there to see how it was going. Specials since "The New Trooper" Weekend at Bernie's inspired riff on A New Hope as Kel and Eila knocked out a First Order Stormtrooper, recruited Neeku and Tam to carry him around unconscious, and then Kaz puts on his armor to infiltrate the other stormtroopers. It's a fun come with some solid moments where it seems like Kaz could get found out. Of course, he did not, and he learned that the Colossus and those troopers are not going to be friendly. After all, they were preparing for a star war. 19659019] For more, make sure you follow us on our new Instagram @ io9dotcom.